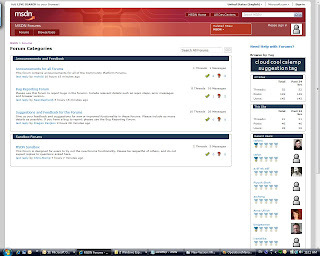 Microsoft has been running newsgroups and forums to provide community support for its products.. incidentally, many MVPs come from forums where they are TOP contributors to the forums..
but this isn't about MVPs today :)it is about MS forums... to begin with Microsoft used Community Server from Telligent to host its forums. And now they are revamping the same on to its own code.. in the background, there seems to be an entire Community Platform emerging with blogs, tags, forums & wikis within Microsoft.. (very much in line with MSs focus on community).. This valentine, I stepped back and thought - what is the one thing that i have fell head over heels for in the last year? i thought and thought...obviously, the first was my family! I always say - "you always carry something of anyone u meet".. and i am a little bit of everyone in my family! so that doesn't qualify, as this love affair has been on for quite sometime :)since last year i have been more and more been talking about how great our country is now.. be it the relative safety of the known in here or the strong social and family network or the simple informal chats with people.. i have loved everything that India has given me.. at more occasions than once, have i found myself advocating being in India than any other country... and so i think my love affair in the last year has with my own country - India.. India is my valentine for this year! Happy Valentine's Day!